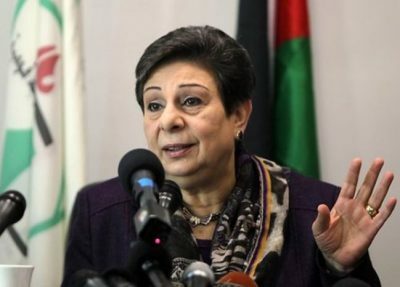 Member of the PLO Executive Committee, Dr. Hanan Ashrawi, on Saturday evening, said that the Israeli government and its allies are responsible for rise in settler terrorism, referring to the fatal shooting by Jewish settlers of a Palestinian man in the village of al-Mughayer, near Ramallah, earlier on the day. “The political climate in Israel negates Palestinian rights and expresses objectionable racism against the Palestinian people. As such, the marked escalation of terror attacks by armed groups of Israeli settlers against Palestinian civilians is a natural outcome of the culture of hate and atmosphere of incitement and violence against Palestinians that this extremist Israeli government espouses and promotes,” said continued, according to the PNN. Ashrawi held the Israeli government wholly responsible for what she described as a heinous crime. “We grieve along with Hamdi Nassan’s bereaved wife and four children. Thirty other Al-Mughayer residents are receiving medical treatment for their injuries. We wish them a speedy and full recovery,” she concluded.